A Wonderful Week of Wilderness! This hike through the full length of Willow Valley and West Clear Creek Canyon was inspired by the photo that graces the cover of the book Canyoneering Arizona by Williams, as well as photos and information about these 2 canyons from the pages here at HAZ and stories about the canyon I have heard from friends and co-workers who had at most, hiked down for a day of fishing or a short overnight camp and then hiked back out, never coming close to fully experiencing all that these 2 canyons had to offer. I wanted to see it all! I love a good adventure and these two canyons seemed to hold the promise of providing a grand adventure and a challenge that few ever undertake. As a disabled veteran with surgeries on both knees under my belt, I have been forced to replace my heavy old school hiking gear with newer and lighter versions, and I have moved more and more into the ultra-light mode of hiking so that I can continue to hike and be outdoors. 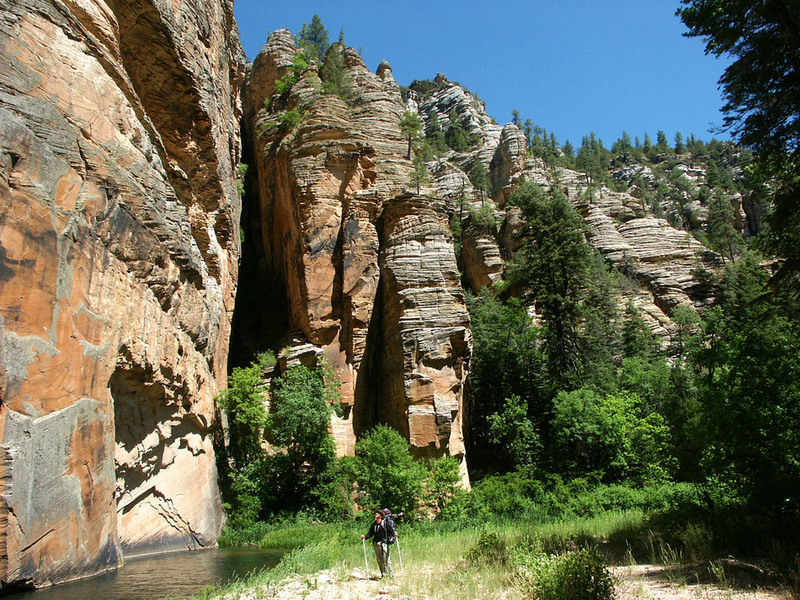 Having grown up hiking the forests and mountains of the Colorado high country near Breckenridge and Leadville and having made several shorter hikes through Devil's Canyon, Aravaipa Canyon and the Superstitions more recently, my children and I were ready to take on a longer trip. 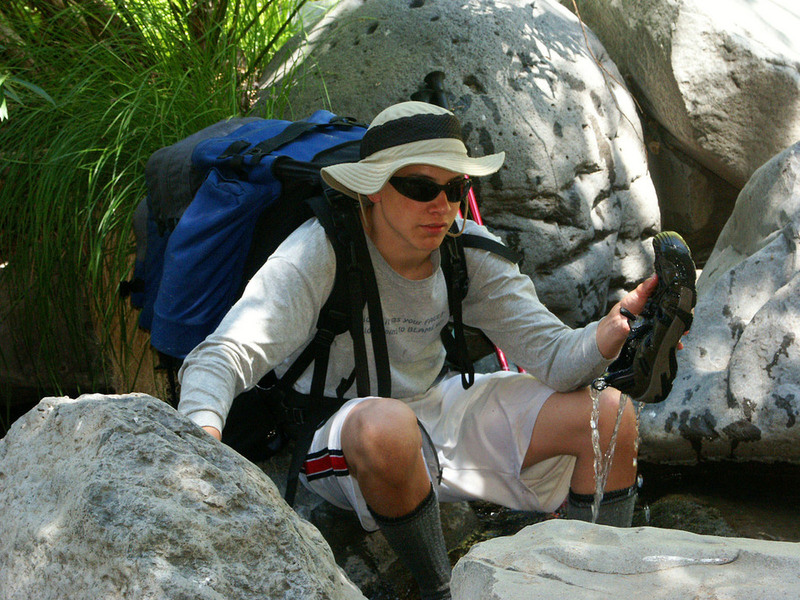 My youngest son Brandon was a senior in high school and was scheduled to go to Navy boot camp in July following his graduation in May and had expressed a desire to hike West Clear Creek before he shipped out, so Willow Valley & West Clear Creek were selected as our next major hike. 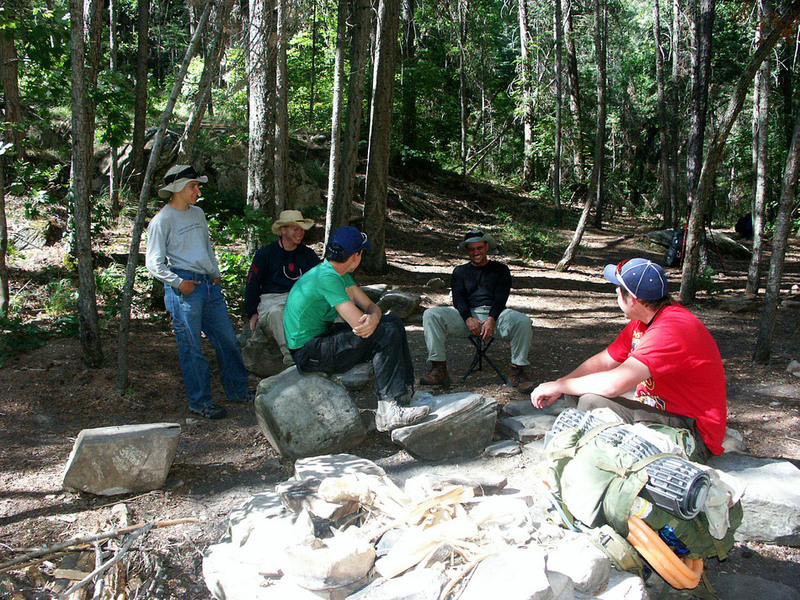 Vacation time was scheduled for the third week of June, 2006 and planning for the hike began. 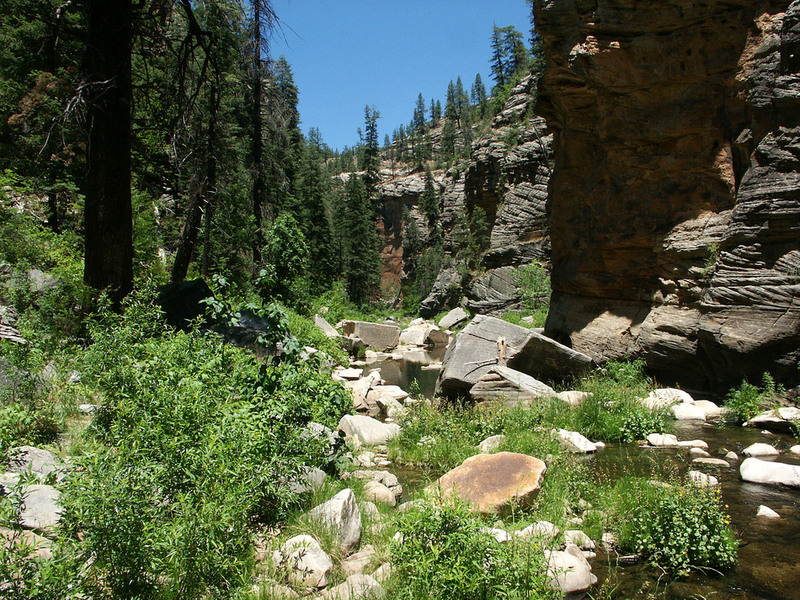 After researching the available information on Willow Valley and studying maps of the canyon I decided that we would start our hike further north than the typically used entrance to the canyon via the trail at Maxwell Tank. 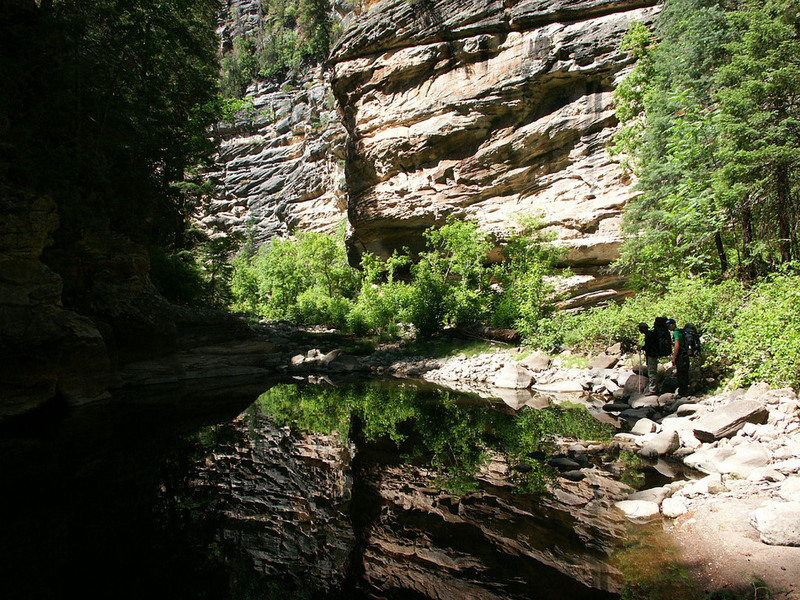 I wanted to hike the entire length of both canyons to ensure that we gained an accurate idea of what they had to offer. Our starting point had us entering Willow Valley after being dropped off by my wife Jill, approximately 4.5 miles upstream of the location where the trail from Maxwell Tank enters the canyon. This turned out to be a wise decision. 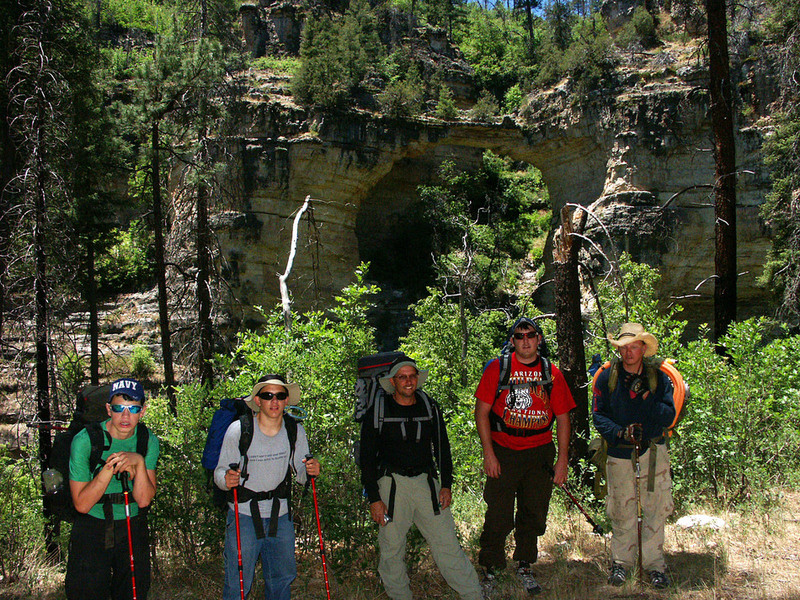 Had we entered the canyon via the Maxwell Tank trail we would have missed the spectacular natural arch that spans the mouth of a side canyon as it enters Willow Valley at approximately 2.6 miles from our starting point. 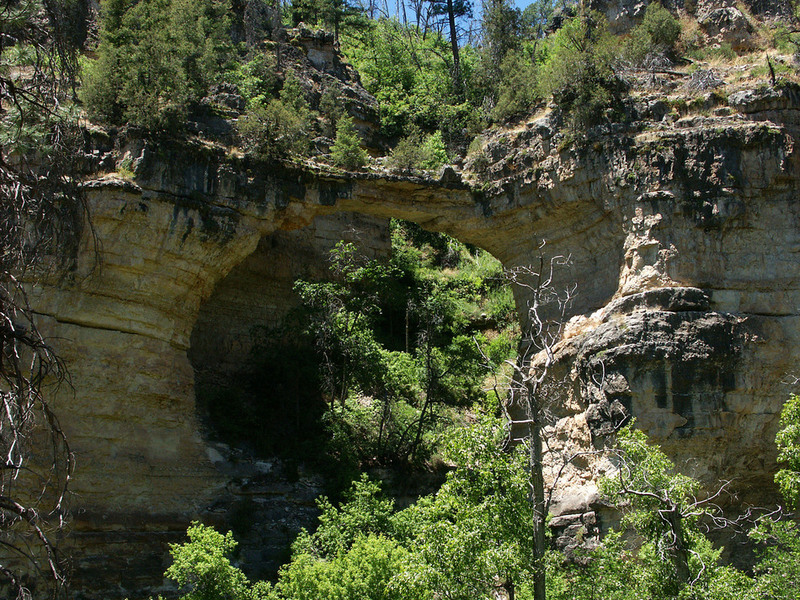 The center of the arch appears to be about 30 feet in diameter with the length and height of the span being approximately 100 feet and forming an almost perfect circle of rock along the west side of the canyon. 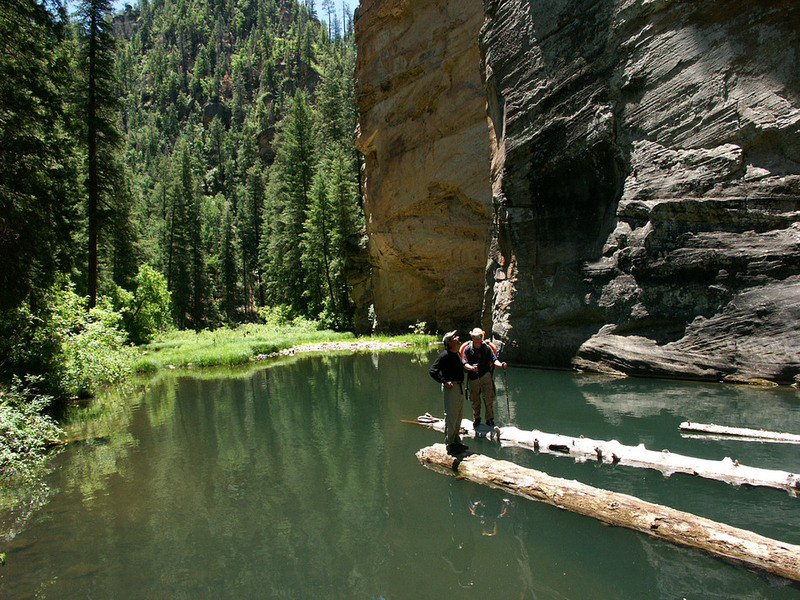 Navigating the canyon is very easy, just follow the water, which will be flowing year round. 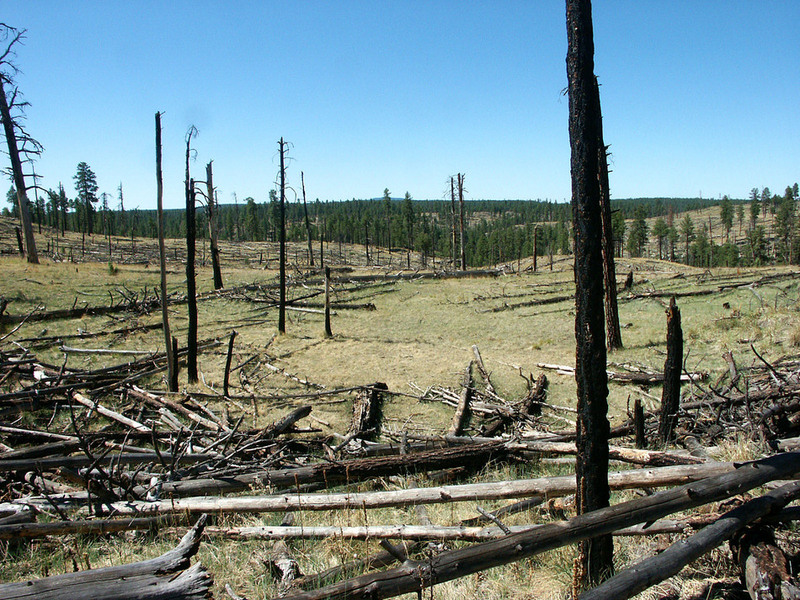 The levels of flow that you see in the photos are the lowest flow of the year, after all the spring runoff is gone and before the start of the monsoon season, fire restrictions were already in place and we were just 5 days prior to the complete forest closure. The only flow left was what is supplied by the springs that flow at a constant rate year round. Upon completing the hike at Bull Pen there is a cell phone signal available that will allow you to contact your pickup person if you don't have a vehicle staged there. We had a cell phone stashed out among the trees and marked with GPS to ensure we had a phone at the end of the trip that the hike hadn't damaged in some way or another and so we didn't have to carry it. (My brother lives nearby so this was easy to do.) (I would be nervous of vandalism to a car left there for a week. 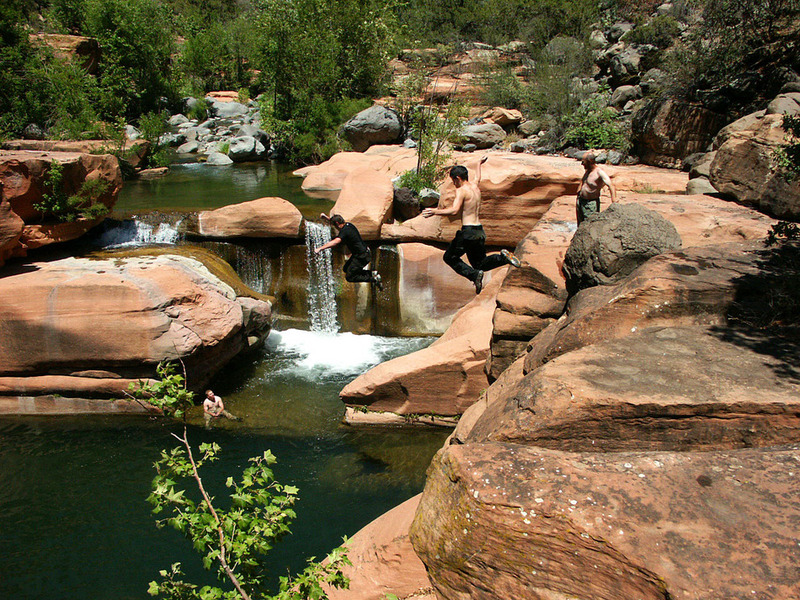 The area's swimming holes draw large groups of fun seekers who sometimes don't respect others property.) Or... if you haven't had enough hiking yet, you can hike out to Camp Verde on the road, as my nephew Ben and I did while every one else waited at Bull Pen for their ride to arrive. This allowed Ben (who had recently made Eagle Scout) to complete the requirements for his 50 mile pack trip badge with the Boy Scouts. 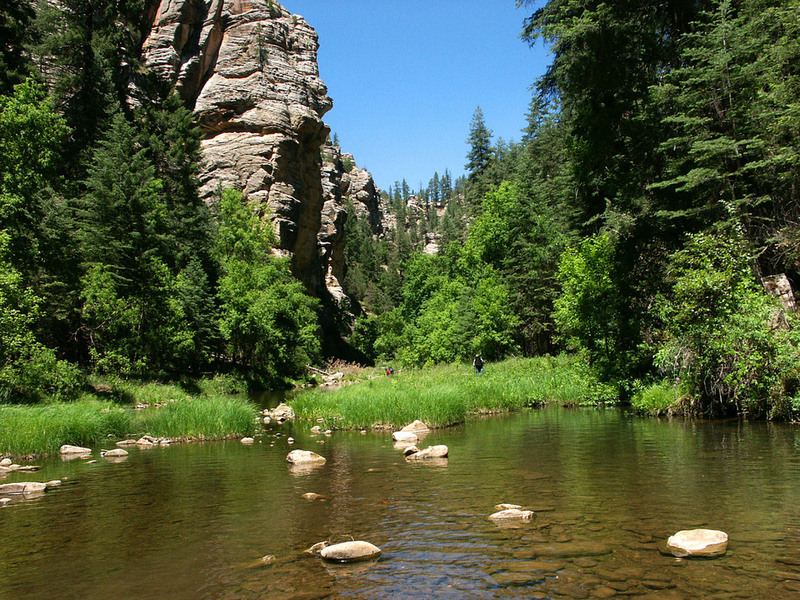 In order to conserve space and avoid redundancy I would refer readers to the hike description of Willow Valley and the other fine hike descriptions covering the West Clear Creek Wilderness area. All of these include descriptions of a few segments of the hike through these two valleys. I will confine my comments to information relative to a hike through the entire length of both of these canyons as a single, extraordinary point to point hike. 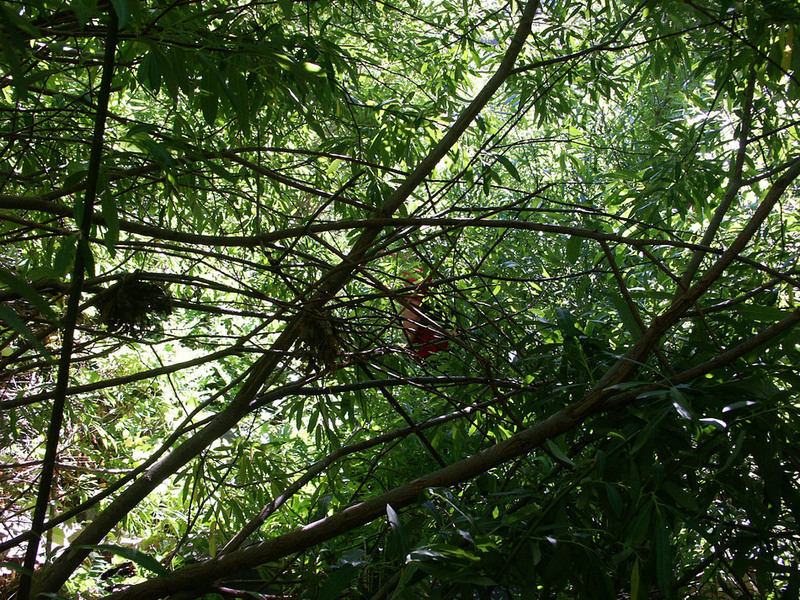 Below you will find information that will help you to safely complete this hike. For a blow by blow of our actual trip please see the trip log for this hike as well as a much more complete set of photos of the canyons in the proper chronological order in my photo set. 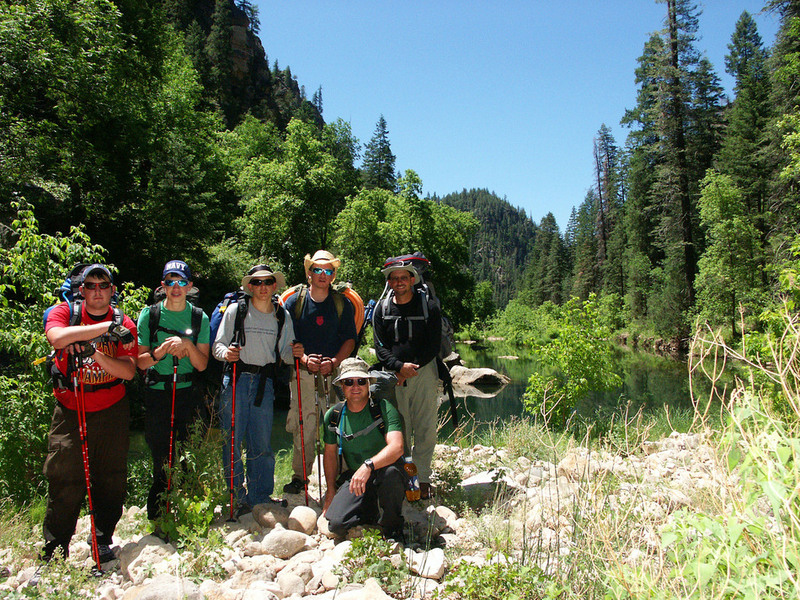 This hike is an absolutely beautiful wilderness experience that I strongly recommend to all who can safely accomplish it. I would be afraid to guess how many twists and turns these two canyons take in there respective courses, while winding their way from the heights of the Mogollon Rim to the depths of the Verde Valley, but whatever the number, there are an equal number of picture postcard panoramas opening up before you as you round every bend on your trek towards the terminus at Bull Pen Ranch. I hope that you enjoy the photos of the canyons but keep in mind that they don't come close to doing the true beauty of these canyons the justice that they deserve. If you enter them please don't trash them and help to carry out the trash of those thoughtless enough to leave trash behind. I will say that we found the canyon's condition to actually be very clean; we didn't encounter any litter of significance until we neared Bull Pen Ranch near the end of the hike. We cannot always haul out all the trash that we encounter on our hikes but we make sure that we haul out ours, and then everyone in our group has to carry out a minimum of 10 articles of trash left behind by others without complaint. Beyond that, each person can decide on their own if they want to add additional trash weight to their pack if more litter is encountered (it is encouraged). I (kneeling) was accompanied by both of my sons, Dustin (4th from left) and Brandon (2nd from left), one of their friends, Josh (far left), my younger brother, Ken (far right) and his son, my nephew Ben (3rd from left). We allowed 7 days to complete the hike and carried supplies for 8 days. We completed the hike in 6 days at a pace that allowed time to stop and play, shoot photos and enjoy the beauty of the canyons. We segmented the hike into sections approximately 6 miles long for each days hike and made sure we had reached that point each day as verified by GPS prior to locating that evenings camp spot. 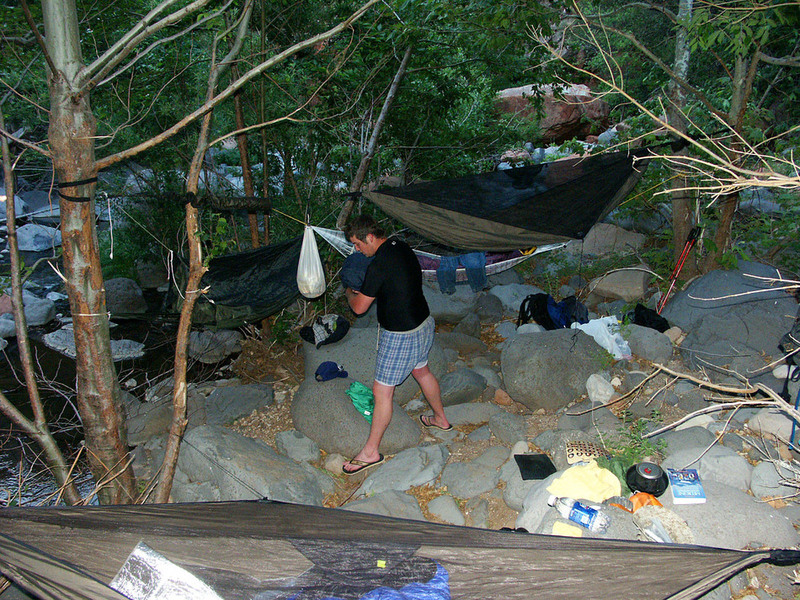 Good camp sites were few and far between, camp sites that would allow the use of a tent were even scarcer, especially through the rocky, narrow central section of West Clear Creek Canyon. If you are using a tent and locate a decent camp site in mid to late afternoon in the section between Wilbur Canyon and Oak Hill Draw don't pass it up! 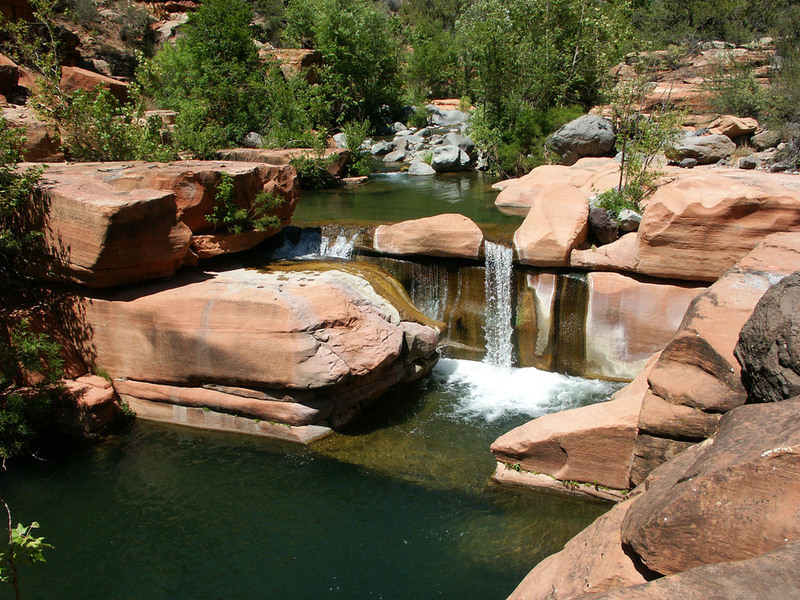 You may find yourself trying to locate a camp site and swim sections of the canyon with your headlamp to guide you, if you do. 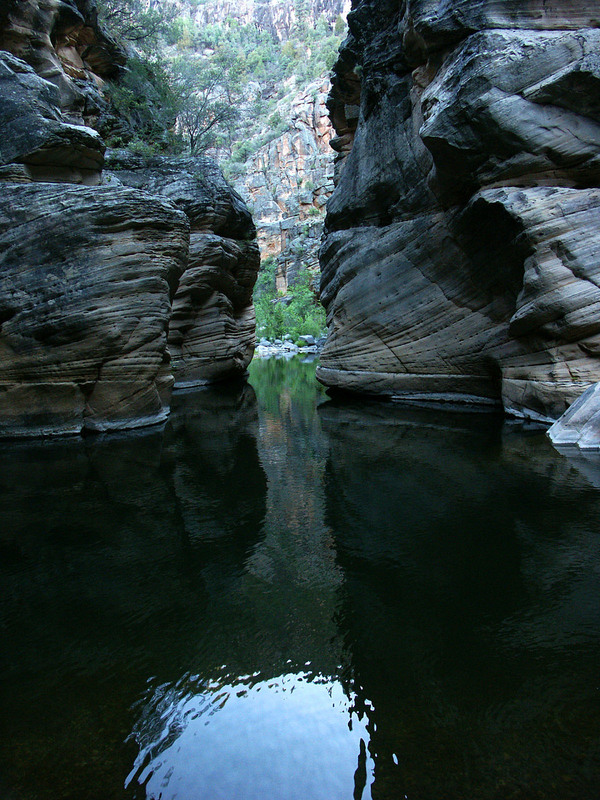 These canyons are very remote and rugged. A through trip like this is not a Sunday afternoon picnic. You need to be well prepared in all respects before attempting this trip. This is a week long trip where you have been dropped off and basically abandoned! You will not have access to a cell phone signal, a vehicle or any other method of escape or contact with the world beyond the canyon, other than your feet. This is a true wilderness experience. Chances are high that you will not encounter any other people in these canyons until possibly the very end near Bull Pen. All members of your party should be familiar with first aid & CPR, basic land navigation with a compass and map, along with the other basic wilderness survival skills. Only you know if you are up to this hike, or not. I will say that in my opinion, your hiking experience should be at the intermediate level or above and will further say that this is not a hike for beginners or small children. I also don't think that this is a hike that you should take a dog on. I have a large Black Lab and he loves hikes, especially if there is swimming involved, but I wouldn't take him on this trip. There are just way to many obstacles that he would have problems with, and at 125 lbs I am not about to carry him over and around them. A smaller dog would have even more hurdles to leap. 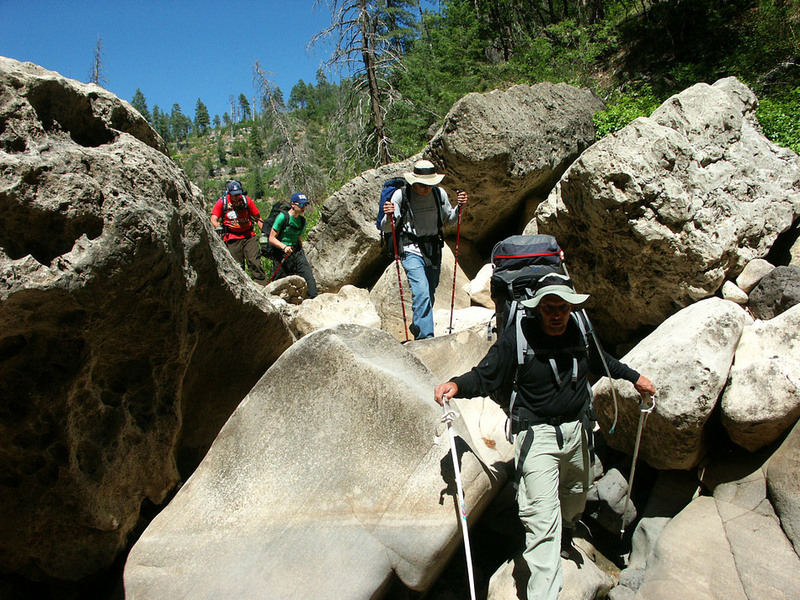 From beginning to end you are almost always moving gently down hill, however due to the rugged nature of the canyon, hiking 6 miles a day is comparable to the exertion level of hiking 12 or more miles on a nice level trail, especially on the days with multiple swims. I would strongly suggest that at least one member of your party be a very experienced hiker with all the skills necessary to be a competent guide for the rest of the party if they are lacking in any of the necessary skills or knowledge needed to safely complete this hike. 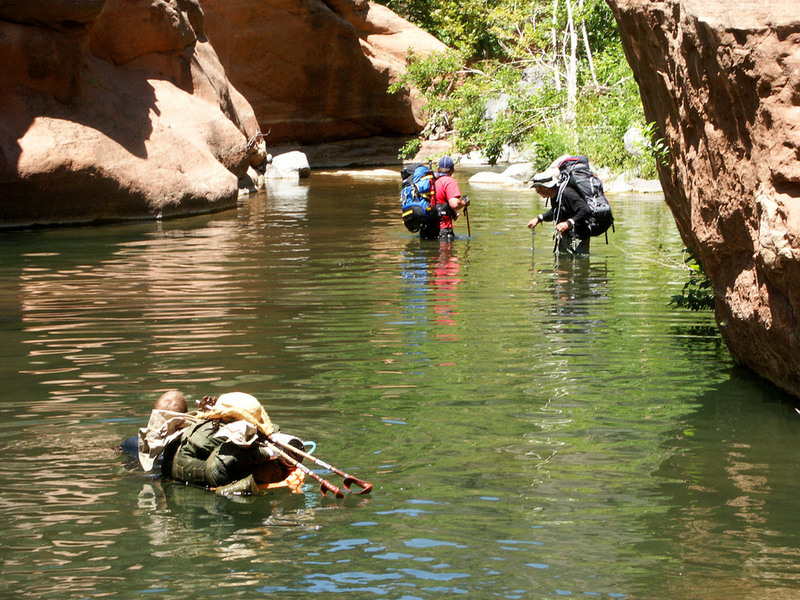 This hike requires a significant amount of swimming, so non-swimmers should probably think about enjoying this hike through the descriptions of this guide and the photos that have been posted here by other members. 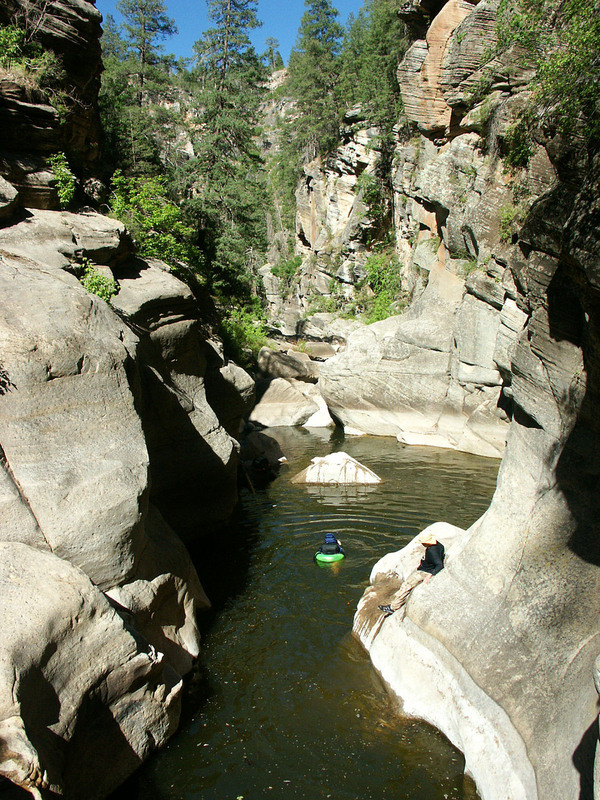 Our 4th day into the hike was the day where we negotiated the narrow central section of West Clear Creek with the White Box and we had to complete 12 swims that day, a couple of which were long enough that we would stop to rest while hanging onto our packs for floatation. We were ready for camp that night. The mileage through the canyons as determined by my DeLorme topo mapping program from our starting point at the beginning of Willow Valley to Bull Pen Ranch was 31 miles. 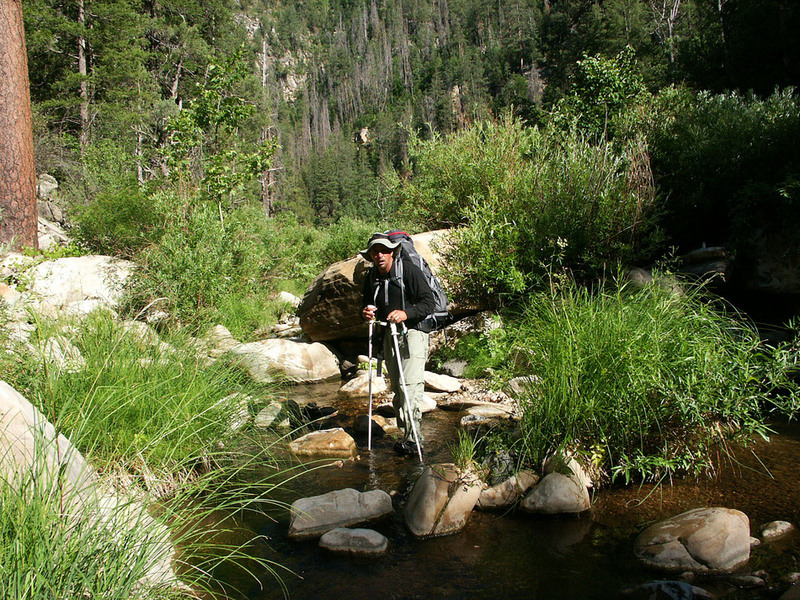 Actual mileage on other hikes measured with this program, using established trails and measured by GPS on the trail, have indicated a need to add approximately 1.75 to 2 miles per every 5 miles indicated on the map for an accurate estimate of the actual trail mileage. This calculation gave us a total mileage of approximately 42 miles from start to finish for this hike not counting side trips and detours. Due to the rugged nature of these two twisting canyons, the lack of a defined trail and the constant need to cross back and forth from one side of the canyon to the other to negotiate the never ending obstacles and pools of water, I believe the actual mileage on the soles of our shoes was probably very close to 46 miles. We did not carry one, but if you want a method of communicating a request for emergency assistance, a satellite phone can be rented on a weekly basis for a reasonable weekly fee on the internet if you so desire. Another more expensive option would be one of the personal, emergency location transmitters that send out an S.O.S. signal and guide rescue personnel to your location. I do not know how the depths of the canyon will affect their performance, however I do know that we often had a difficult time getting a position fix on the GPS unit due to high canyon walls that block reception of satellite signals. So do your homework if you plan on using one of these items and always remember that electronic items can and do fail, due to batteries dying, breakage or immersion in water, so don't entrust your life to them. Always carry a compass and a map and know how to use them. 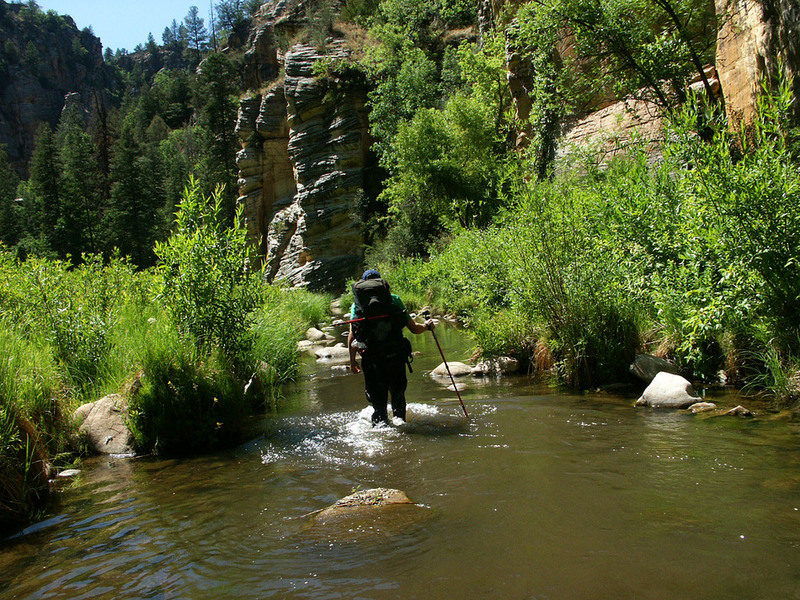 In the event that you should need to exit the canyon due to an emergency such as a snake bite, a broken leg or other such calamity, that is not the time to suddenly be trying to figure out which way north is on your compass. If you do have to exit the canyon remember that you are leaving behind your source of water and you need to have the ability to carry extra water to get you out to the highway where help can be flagged down. Don't leave your gear behind you so that you can move faster. Emergency supplies can't help you if they are not with you and this rugged area of central Arizona has claimed the lives of more than one hiker and you won't be able to get help for anyone, if you don't make it out. Be prepared, be smart, return home alive! Depending on the nature of your emergency you may need to be able to direct rescue personnel back to where your injured party member is awaiting help, so mark your trail and locate landmarks to guide you back. If possible get a GPS location for rescue personnel to home in on and use GPS to guide you out to the highway. Never travel alone if at all possible. I will raise the issue of potential snake bites for two reasons, first, due to the already noted remoteness and rugged nature of these canyons and the time and effort required to exit these canyons, a rattlesnake bite would be a significantly more dangerous injury than it normally is due to the delay in medical attention and the administration of anti-venom. Secondly I have been warned by at least 5 different individuals that have spent varying amounts of time in these canyons, that there is a significant rattlesnake population within them. 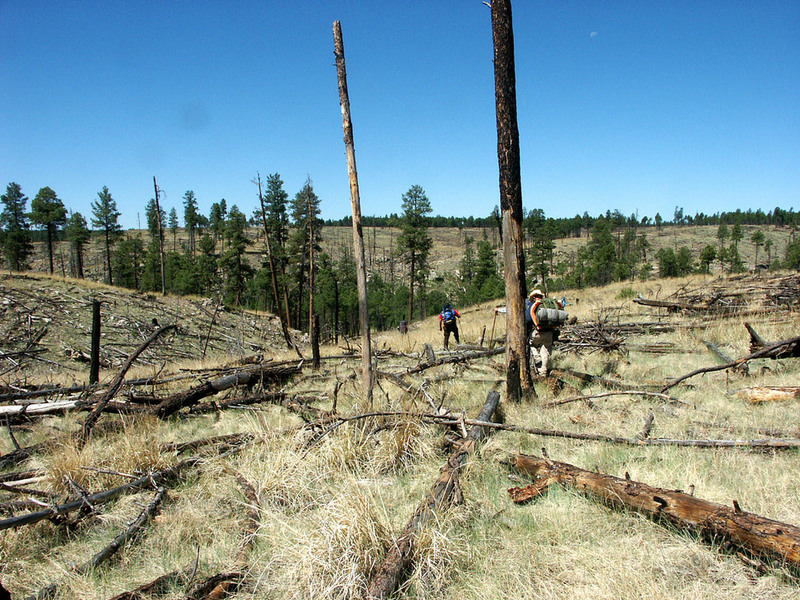 Both timber rattlers in the grassy wooded upper reaches of the canyon and diamond backs in the lower sections nearing Bull Pen have been mentioned. We personally saw 4 rattle snakes, all diamond backs and all in the lower half of West Clear Creek. Be alert and avoid the snakes, they will try to get away from you, let them go. If you happen to jump one while working your way through the canyon, just backup a couple of steps and let it move out of the way. They will not chase you, and the largest rattler in Arizona can only strike about 24 inches. You cannot risk a snake bite down in these canyons, or any other remote area for that matter so be alert and give the snakes plenty of room to escape and don't try messing with them. Remember where you are! Make sure that you are up to speed on the most recent protocol for treating a snake bite and have an emergency plan ready to execute if you need it. 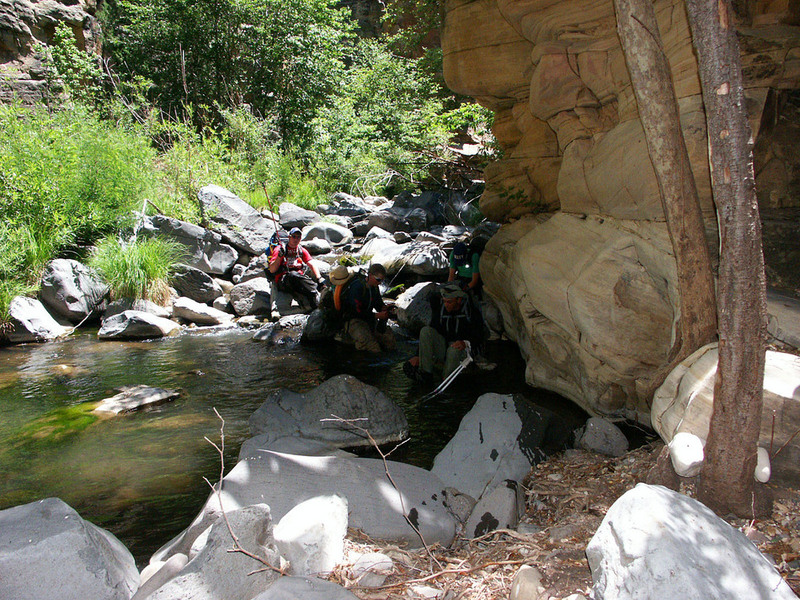 Throughout both canyons I have located spots, based on topographical map data where an escape out of the canyon could probably be made in the event of an emergency situation that required a team from your party to exit the canyon to get to help and rescue services. I will include this information below. There is no cell phone service in the canyon and even up out of the canyon along the rim, there is no cell service along most of its length. GPS coordinates are given for all escape route points within the canyons along with bearing and distance to a Forest Service road and directions that will get you to either highway 87, Lake Mary Road or highway 260 and help. The 6 mile points along the hike are also identified with GPS coordinates. All bearings given are true, and magnetic declination will need to be allowed for if using a compass, the electronic compass on your GPS unit, if it has one will automatically give you the true bearing. Declination information will be included below. Note: If any of the terms used in this paragraph are unfamiliar to you or you don't fully understand how they affect you, I would strongly suggest that you bone up on your land navigation skills. Look up "orienteering or land navigation or wilderness navigation" on the internet, make sure that you understand the basics. I would like to make a few gear recommendations based on our experience in the canyons that you might want to use or not depending on your personal preferences. 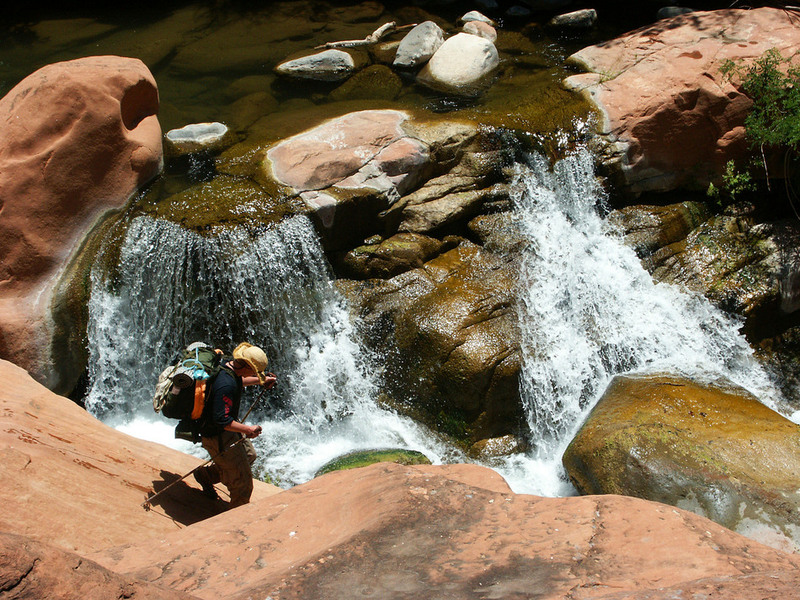 This hike keeps your feet wet all day long. We knew this in advance and tried to plan accordingly. All of us used the popular water hiking shoes that allow water to drain via open holes in the shoes (Teva, Keen and Merrell). In retrospect, I absolutely do not recommend these types of shoes or any other open sandal. These types of shoes would be great if you were on solid rock all of the time or on a short day hike. 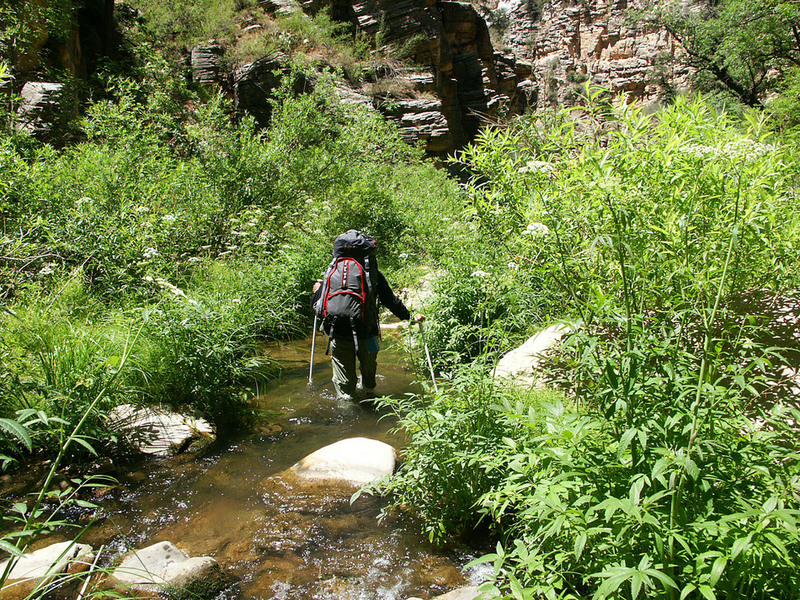 Much of hike through Willow Valley and West Clear Creek requires wading a creek bed that is sandy, gravely or rocky. We were literally, having to stop every 10 to 15 minutes in many sections of the hike to dump rocks and gravel out of our shoes that the drain holes allowed in. This became extremely tedious after the first 156 times that we dumped them! It didn't take long before you just started ignoring the rocks in your shoes unless it was a big one and kept going, hiking on the rocks. The last couple of days were just slightly better than hiking barefoot. We didn't suffer any major blisters or other major trauma mainly because we were moving at a somewhat relaxed pace and dumping the rocks regularly for the first couple of days allowing our feet to toughen up as the miles rolled by. (I suspect that if science could replicate, on a large scale, the calluses that I had on my feet at the completion of this hike, we could manufacture tires that would never wear out!) It was just plain unpleasant hiking in respect to our shoes. I would recommend a mid to high top hiking boot that is not leather, with no holes for water drainage, just a mesh type synthetic upper that will allow water to drain slower but can be tied securely to prevent debris from entering the shoe. This is really a mater of preference; however I will give you my perspective, having used both on several hikes. I currently use a Hennessey Hammock, having discarded my tent in my bid to reduce pack weight on my battered knees. The only area that I have found a hammock to be deficient in is cold weather. Tom Hennessey has come up with a solution to this issue as well with the introduction of the under cover. An additional layer of sil-nylon can be attached on the bottom of the hammock with a layer of open cell foam in between for insulation under you in cold weather. The traditional swaybacked sleeping position of a hammock has been eliminated with the asymmetrical design of the Hennessy hammock. Lying slightly off center, you pretty much assume a horizontal sleeping position. 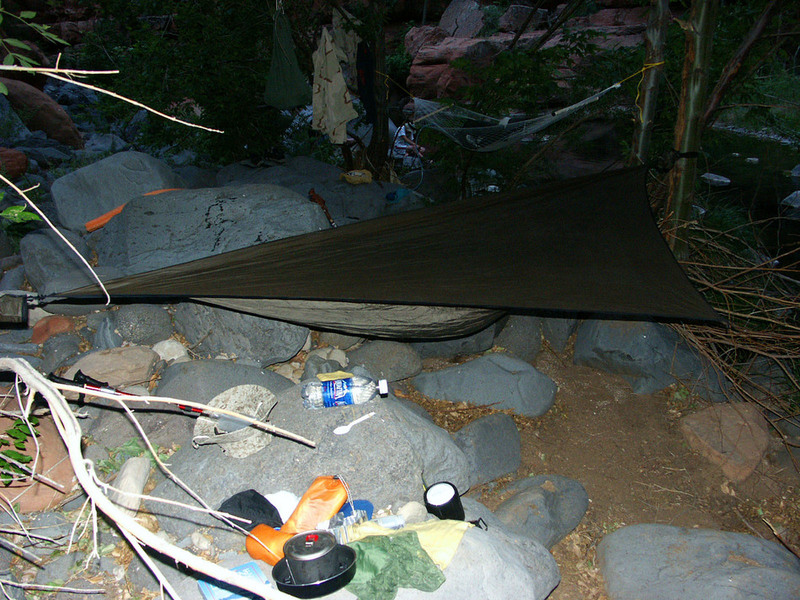 I can set up my hammock in about 3 minutes above rocks, water, brush, mud, a 45 degree slope and all the places that a tent could be set up. In the unlikely event that there are no trees, rocks or other methods of hanging this hammock, it can be pitched like a tent on the ground using your trekking poles or sticks as supports on either end. You have a comfortable peaceful place to sleep at night without having to clear an area of debris and rocks. You have a fully enclosed, roomy, bug free space that is completely weather proof with the use of the rain fly. 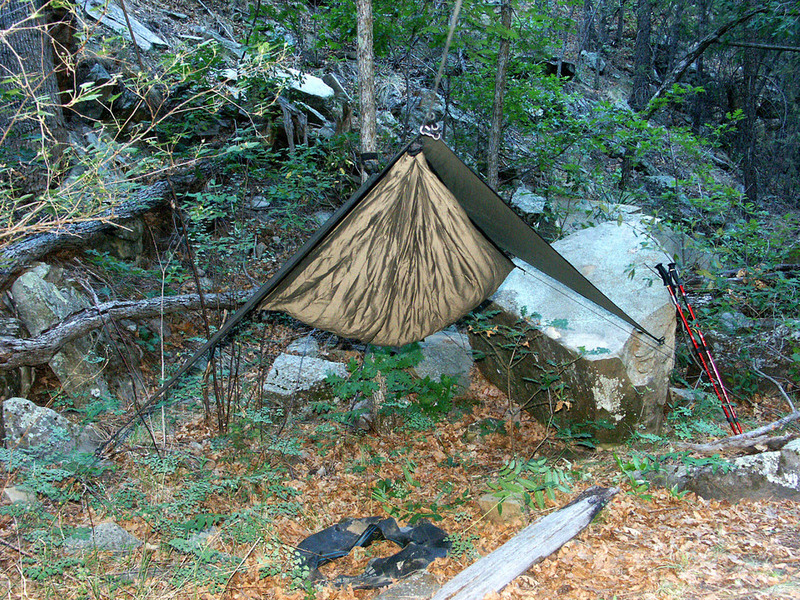 Additionally your pack can hang under the rain fly at the end of the hammock as well, staying dry and mud free. I have slept warm and completely dry through torrential monsoonal downpours while all those camped with me in tents, were soaked from the runoff water running around and through their tents and caked with the mud that this water was moving. My hammock and rain fly weigh in at just under 2 pounds (30.87 oz). My old tent weighed in at just over 5 pounds (85.5 oz). The rough rocky terrain within these canyons really highlighted the benefits of a hammock vs. a tent. All members of our party used hammocks of one sort or another. 2 of us had Hennesseys, the others wished they did! Food for thought! 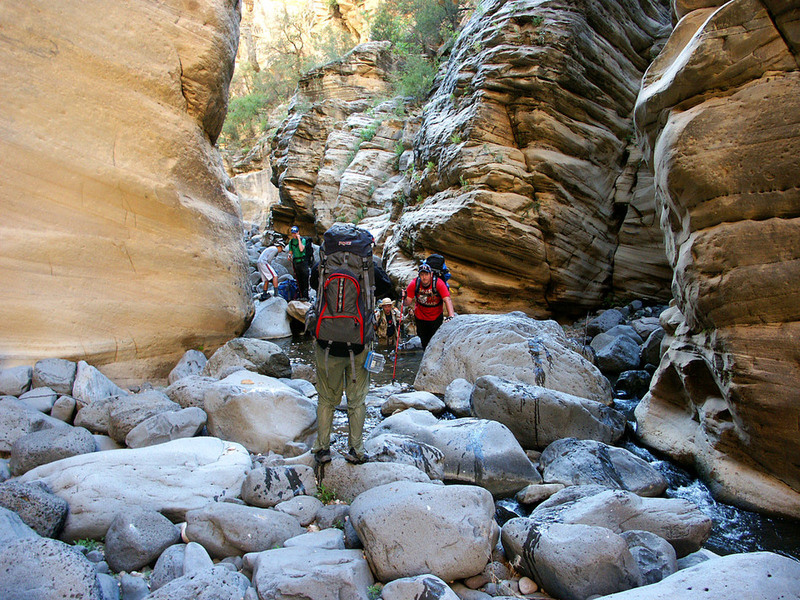 We opted to avoid using the trash bag method of water proofing gear in our packs as we had done on other canyon hikes due to the length of this hike and the need to repeatedly access our gear throughout the hike. 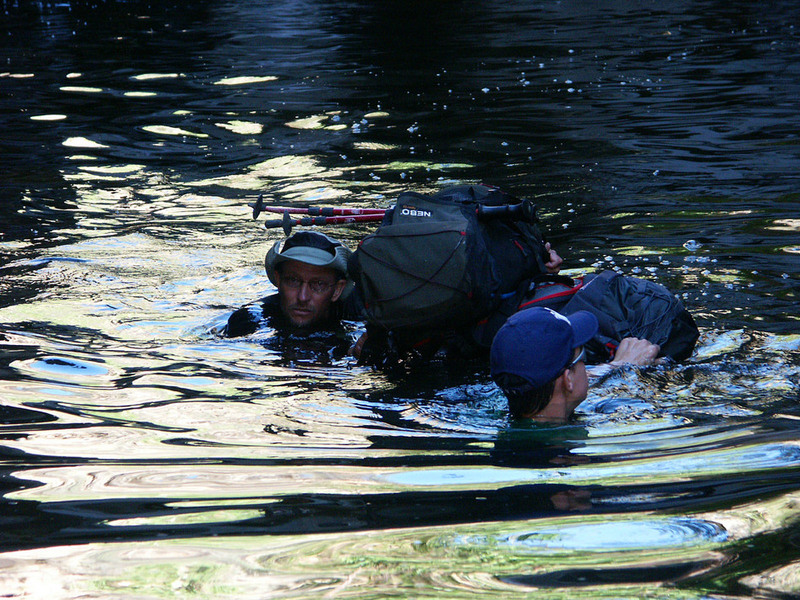 For example I would have to stow my camera prior to every swim and then dig it back out once I was out of the water. Several of our party used the standard vinyl coated dry bags and they worked well, (when properly sealed!) keeping their gear dry through repeated immersions. We had one day when Brandon did not have a good seal on his dry bag and he took on water. Fortunately his food was being stored in a sil-nylon stuff sack and inside zip-lock bags so he didn't lose any chow. His sleeping bag however was drenched. I couldn't get the camera going fast enough when he and Dustin decided to try and squeeze the water out of the sleeping bag. I told them that they were going to hate seeing this photo on the internet! Here it is! (Guess who's getting tossed in the creek next time out!) I used a "Sea to Summit" Ultra-Sil Pack Liner that was significantly lighter than the vinyl coated dry bags but also more susceptible to punctures from thorns and such if I set my pack in the wrong place or got up against the wrong bush. All in all I would use the Ultra-Sil Pack Liner again in the future and cut a new closed cell foam sitting cushion to exactly fit the bottom of my pack and then keep this between the pack and the liner to protect it from punctures when the pack was set down This cushion might have to be held in place with a small strip of Velcro affixed to the inside bottom of your pack to prevent shifting of the pad. A couple of the kids brought extra buoyancy to ensure that their packs would float. This turned out to be completely unnecessary as the natural buoyancy provided by the air within our sleeping bags, clothing and other gear within our packs provided enough buoyancy that the packs sat very high in the water and could be relied on to provide plenty of buoyancy for the pack and the hiker should he need to rest and just hang on to the pack in the middle of a long swim. This also is a matter of preference but I will say that we saved a lot of weight by mainly using freeze dried meals. They were easy to prepare, required less cooking equipment and less fuel and require less time to prepare which allows more time in camp to relax, swim, fish or whatever. There is a huge selection of wonderful meals to choose from so you don't have to have boring food to save weight. We saved money on the freeze dried meals by buying in bulk in the large #10 cans available from some of the emergency preparedness supply companies you can locate on the internet (www.beprepared.com). We then packaged our own portions in zip-lock bags rather than buying the expensive single or double portion foil pouches available at most sporting goods stores. This also significantly reduced the amount of extra packaging/waste/weight that we were carrying with us and allowed us to custom size our portions as well. A small slip of paper was inserted in each bag that stated how much water was needed to re-hydrate that meal. 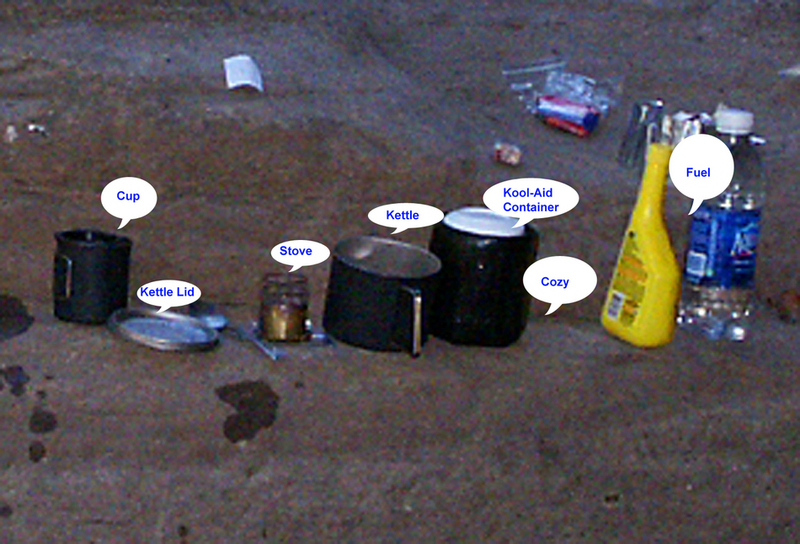 We re-hydrated the meals in a large Kool-Aid container that each of us carried. These were kept in an insulating cozy made from a cheap 1/4 inch closed cell foam sleeping pad and assembled with duct tape. Using a punch to put a small hole in the bottom of the cozy allowed it to easily be slid on and off the Kool-Aid container to allow for cleaning. The inside of the lid of the Kool-Aid container is marked for, 1 cup and 1/2 cup which makes adding the correct amount of boiling water to your meal an easy task. This system works great and has been used repeatedly with no problems. I no longer carry my old canister stove but rather an alcohol burning Brasslite model that weighs only 1 oz and boils my titanium kettle of water in about 1 minute. This generally gives me enough hot water to re-hydrate my meal and allow a cup of coffee, tea or coco. This stove is not a good choice for actually cooking food but our meals require nothing more than boiling water and in this task the Brasslite excels and has no parts to break or wear out on the trail and it tucks nicely into my cup with my coffee filter. Fuel (methyl alcohol) is easy to obtain, I use "Heet" (the yellow bottle) automotive fuel line antifreeze and water remover, available at stores everywhere, and use 1 oz per meal. A little note on the use of titanium verses aluminum cookware. I use an MSR titanium kettle and cup, if I were buying the items again I would probably opt for aluminum. The only real advantage to titanium is its durability, it's hard to bend and mess up. The aluminum weighs almost the same, is about 1/4th the cost and heats faster than titanium. You decide. I have listed several items below, to include landmarks, distance markers and escape routes should you need to send for help. You will be in a remote and isolated area where getting help is a major undertaking. All information and advice is posted for your information and use, our hike and situation may be entirely different than yours so use your own common sense and good judgment on this hike. All members of our party carried a compass and a laminated map of the canyon area with a copy of the data listed below printed on the reverse side of the map. We also carried 2 GPS units with us. 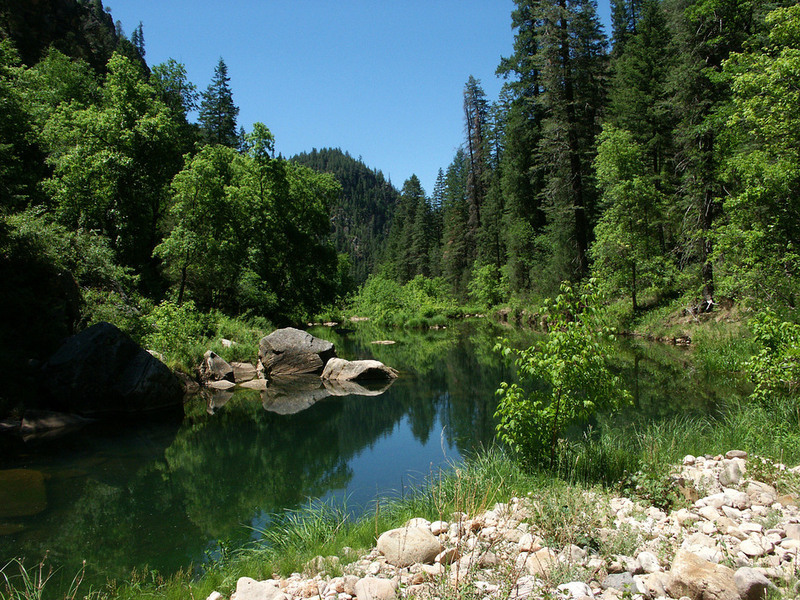 Note: All escape routes along Willow Creek are to the east of the canyon or to the left when facing downstream. 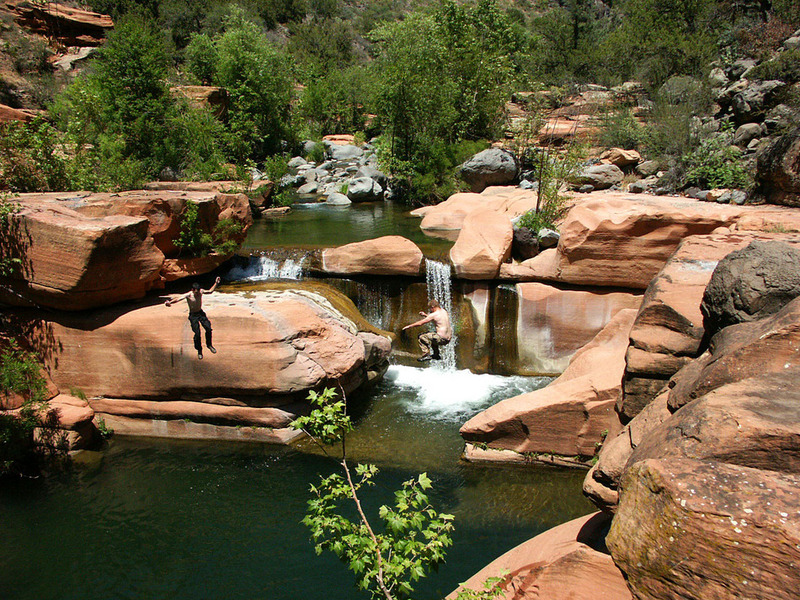 While there are trails such as the Maxwell Tank Trail that enter the canyon from the west, you cannot reliably count on finding someone that can help you on, or near these trails, or the roads that access them. 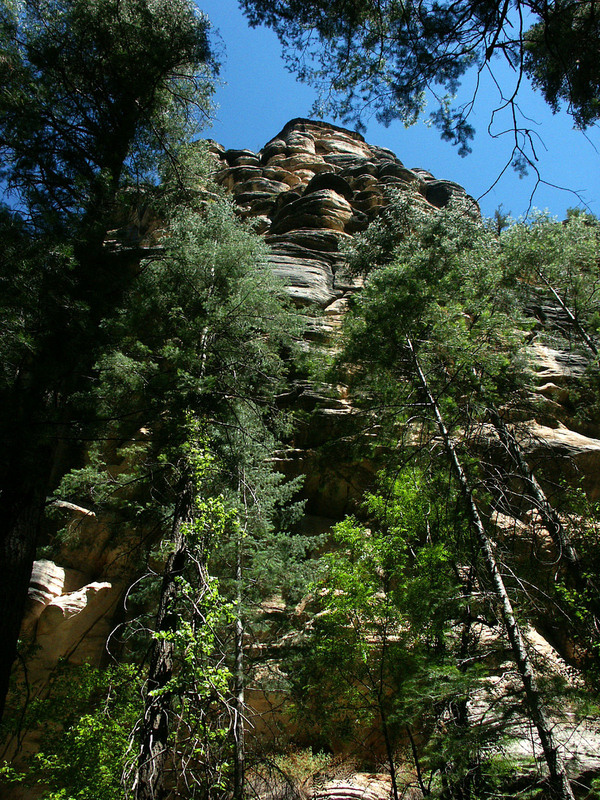 The distance to a paved highway from this west side of the canyon is much greater that that required to reach a highway, and help from the east side of the canyon. Upon reaching the indicated access road on the escape routes from Willow Valley, travel will be to the east towards Lake Mary Road or hwy 87. Estimated bearings of travel to Lake Mary Road will vary between 070 and 090 true. At the confluence of Willow Valley and Clover Creek the closest route out to help is upstream via Clover Creek and east to hwy 87. Once you have passed downstream of Clover Creek into West Clear Creek, the quickest route out of the canyon to help will be to the south and hwy 260 where you can flag down help. 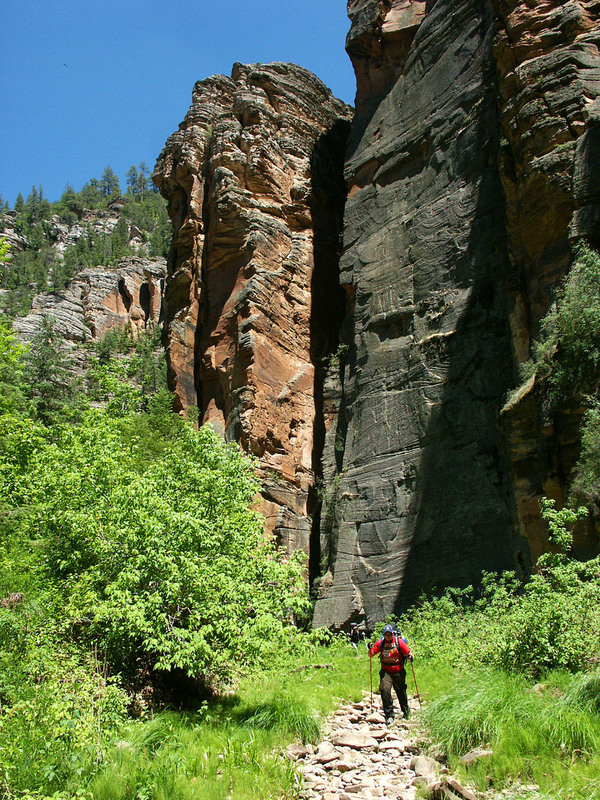 Once again, here along West Clear Creek there are trails that enter the canyon from the North but the distance to a reliable source of help to the north can be as far away as 15 miles by air. Exiting the canyon to the south generally will get you to highway 260 in about 5 miles. 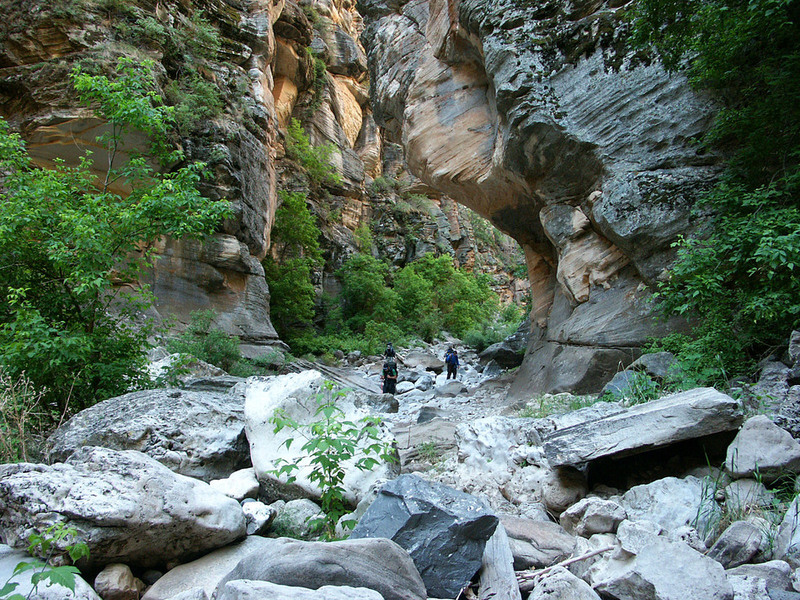 Once you are downstream of Clear Creek Spring #3 any run for help will need to go down the canyon towards Bull Pen. Hwy 260 is directly south and runs parallel to the canyon. 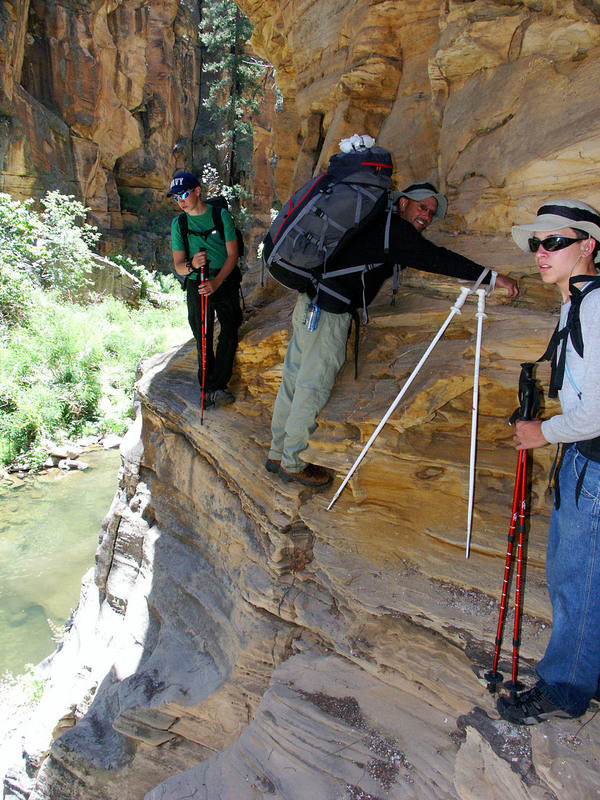 Escape routes were determined by topographical map as the easiest route out of the canyon in that area, however the actual obstacles that will be encountered on each escape route are unknown. 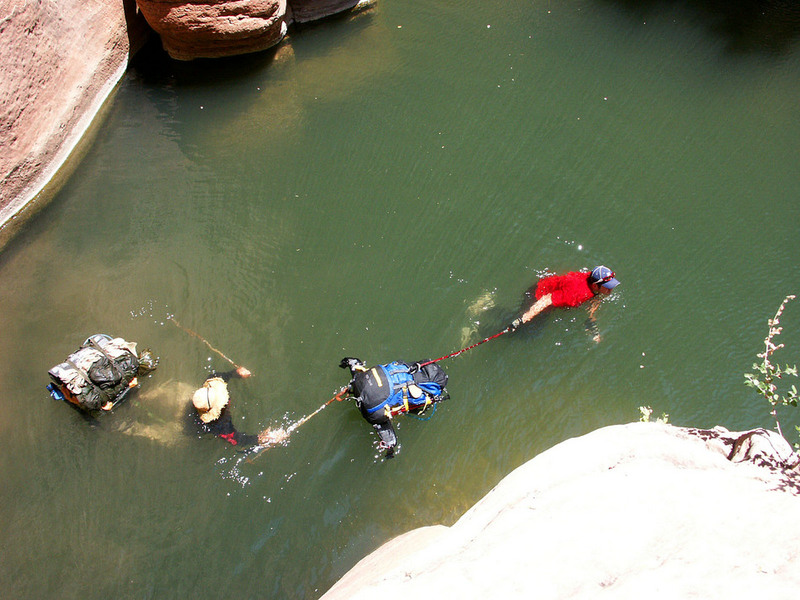 Good judgment and common sense must be exercised to prevent the need for a secondary rescue or worse. Cliffs in this area can exceed 1,000 feet in height. Turn back if that route is not safe and find another route that works safely. Keep in mind that when following a bearing, there will be obstacles in your way that will prevent you from walking a straight line of bearing. Sight a landmark along your bearing and guide on that, checking your compass often to ensure you don't stray to far off your desired bearing. Repeat this until you reach your destination. If you get confused or disoriented remember you are in an area that is bordered by highway 260 to your south and it runs parallel to West Clear Creek. Always move southward from West Clear Creek and you will get to the highway. You are also bordered in a parallel fashion by highway 87 to your east when in Willow Valley, again Always move eastward from Willow Valley and you will get to the highway. Escape Route Clover Creek to hwy 87 just south of Clint's Well. Bearing from confluence of Willow Creek and Clover Creek is 130, travel upstream approx. 2.5 miles to 12S 0465251 x 3821015, then turn left on bearing 045 for approx. 1.5 miles to road, then turn right on road and follow east to hwy 87 about 3 miles, turn left on hwy 87 to Clint's Well. Escape Route Tule Canyon bearing 148 for about 2/3 mile from 12S 0454040 x 3825390 to road, follow road south to hwy 260 bearing west and south at all major intersections Home Tank Draw & 24 Mile Point, 12S 0452095 x 3826365, this draw out of West Clear Creek is to the north and will lead you up and out to Buckhorn Ranch on the rim of the canyon at 12S 0452298 x 3827425. Forest Service road 81A runs past the ranch from east to west this ranch could be used as a staging area for a rescue and possibly provide shelter in ranch buildings, condition and even the existence of such buildings is unknown to me, occupation of the ranch is unknown as well, if possible, avoid using this route to go for help. 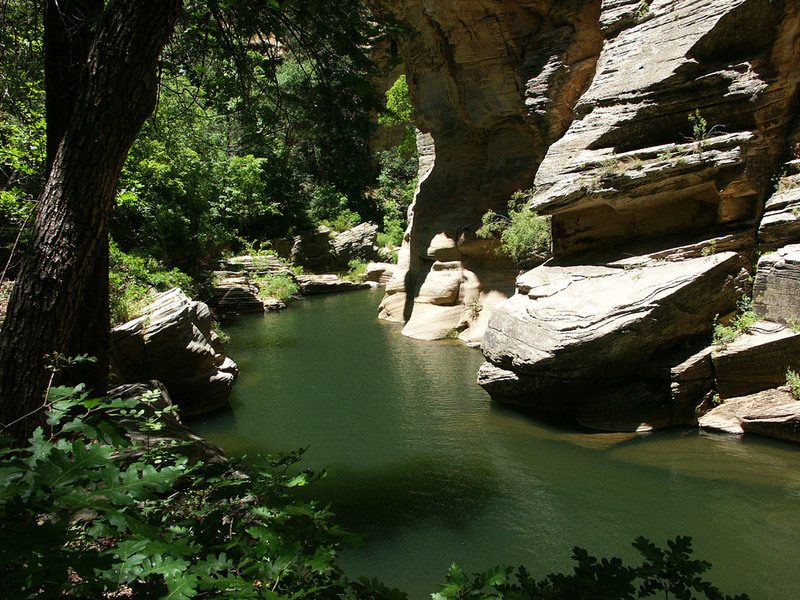 From this location on the north side of the canyon you would have to travel 15 to 20 miles west to reach a main road. The escape routes heading south of the canyon in this same area only require about 5 miles of travel to reach hwy 260. Another way to think about this scenario is doing the opposite of your declination value. For example if your declination value is -11, then you will add 11 to the compass bearing to adjust for this error. And if your declination value is +11, then you will subtract 11 from the compass bearing to adjust for this error. The Magnetic Declination for West Clear Creek as of the summer of 2006 is 11 Degrees East or +11, add 11 degrees to your current bearing to determine your actual bearing. Subtract 11 degrees from the true bearings listed in the escape routes above to determine your correct bearing of travel to the points listed. Many compasses have an adjustment that allows the magnetic declination to be preset on the compass thus avoiding the process of having to calculate the effect of declination on your compass bearing or a given true bearing. If you are purchasing a new compass this is a worthwhile option to look for. To reach the start of the hike, from Flagstaff travel south east on forest road 3 (Lake Mary Road) and after approximately 48 miles turn south off of Lake Mary Road onto an unmarked Forest Service Road at: 12S 0468322 x 3831775. Or from Clint's Well follow Lake Mary Road west 5.7 miles to your turn south or left on to this road. This road is lightly traveled but not terribly rough, and can be accessed by any high clearance 2 wheel drive vehicle and probably a lot of cars if they are not real low. If it is muddy you might want 4x4 but there are no significant hills to climb just a Forest Service dirt road. Follow this road for approximately 2.25 miles to its end at: 12S 0465979 x 3829536, the start of the hike. From this location hike SW on a bearing of 188 degrees (true) and enter the upper end of Willow Valley at 12S 0465750 x 3828400. 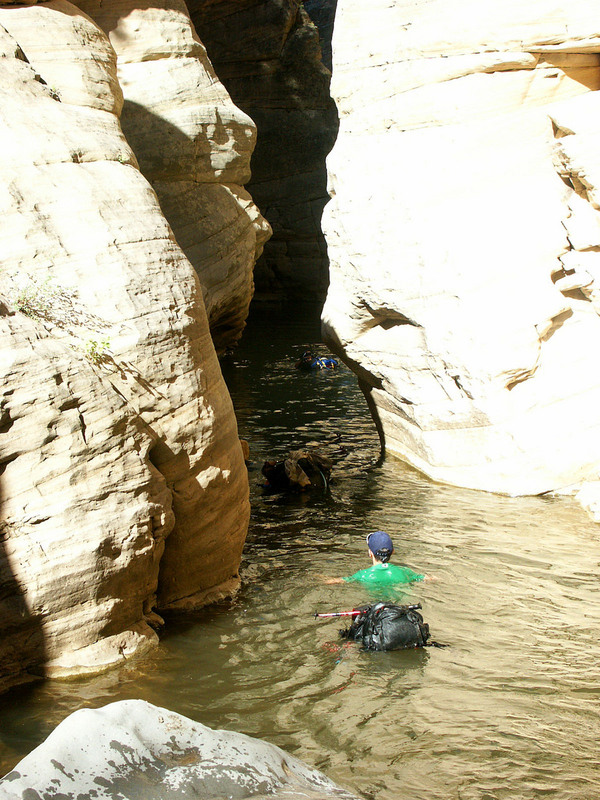 Once you enter the canyon, route finding is relatively simple in that you just follow the canyon downstream and negotiate the obstacles within the canyon itself.